Emperor Calus is the former Emperor of the Cabal Empire, who was usurped by Dominus Ghaul many years prior to the Red War. "For centuries, I led the revels of my empire, and the stars themselves burnt sweet and clear. But in time the jealous and the tight-fisted rose up and sent me into exile." Many years prior to the invasion of the Solar system, Calus led a populist revolution to eject the military aristocracy known as the Praetorate from power and became Emperor. By his side during the revolution stood his long-time friend and protector Shayotet, who stopped numerous attempts to kill Calus. Under his rule, the Cabal Empire became a seat of all-encompassing hedonism and revelry. His accomplishments during that time included redistributing Praetorate wealth to the people, granting citizenship to the Imperial Legions, and putting down various alien threats such as the Sindu, the Clipse, and the Psions' OXA Machine. However, when the OXA machine was rebuilt by the savant Otzot, Calus was impressed enough by her genius to order the machine preserved and hold a festival in her honor, elevating Otzot to his court as Imperial Dreamer. One of Calus' pleasures was the Coliseum, and one day, an albino gladiator, bleached from prolonged exposure to solar radiation due to being cast out as an infant, named Ghaul made his first appearance there. Ghaul's patient skill and unusual coloration soon made him a favorite of Calus', and the Emperor eventually made him Primus of the Red Legion, where he believed his talents would be put to better use as the head of the most fearsome Cabal legion ever assembled. Calus grew to love Ghaul like a son, and believed they were kindred spirits who both envisioned a newer, more perfect world. Ghaul's association with The Consul and members of the Praetorate worried him, but not enough to cause him to take any action. Behind his back, Ghaul was in fact organizing a coup with the Consul and some of Calus's closest friends and advisors: Umun'arath, Shayotet, Otzot, Moli Imoli, Iska'al, and Caiatl. Ghaul launched his coup in the dead of night. With the Emperor too popular to simply execute, Ghaul, his Red Legion, and the Consul arrested Calus and an unknown number of supporters in his own court and exiled aboard The Leviathan, taken far from the Empire along a pre-programmed course. On the Leviathan, Calus wallowed in despair for an unknown amount of time until a strange event shook him out of his stupor. The Leviathan had come up against an expanse of utter nothingness, shorting out the navigation systems and the course the conspirators had set. Calus looked into the void and came to an understanding, believing that it had chosen him to herald its inevitable victory. He would watch it consume the light of the universe, and all among the last of the living would know his greatness. 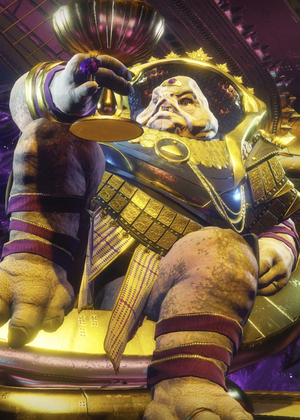 For an unknown period of time, Calus has been using the Leviathan to consume planets and grind their soil into dust to mix with spores from the flowers in the Pleasure Gardens to create "Royal Wine", which he would then consume to give himself vast psionic powers. After the death of Ghaul, Calus immediately set to work on reclaiming the empire. He gave elements of the now leaderless Red Legion the chance to "join the loyalist regime," sending them on missions to collect geological data on Nessus. Calus intended to convert the soil of the planet into Royal Wine. The Leviathan arrived at Nessus soon afterwards and began consuming it, and it has remained there since. Calus extended an invitation to The Guardian to board his vessel for slaying Ghaul. The Guardians accept Calus' challenge and following a long journey through Calus' palace and defeating his loyalist army, the Guardians seemingly meet Calus in person in his throne room. Facing off against the exiled Cabal Emperor, the Guardians witness his strange powers and after dealing critical damage, they find that the Calus they are facing is really a robotic duplicate. Regardless, the Guardians succeed in destroying the robot. Before the machine's destruction, Calus boasts about his power and claims to know the "real truth" about the galaxy. Nonetheless, he rewards the Guardians for completing his challenge and offers them a place by his side should they seek him out. As the Guardians step past the machine's body into a large room to claim their reward, they see countless robotic bodies, all in the image of Emperor Calus. At some point months later, the Leviathan consumed a chunk of Nessus that contained a powerful Vex Mind, Argos, Planetary Core, the entity responsible for converting Nessus into a perfect Vex world, which then caused the world-eater to clog up and malfunction. Emperor Calus immediately called upon the aid of the Guardians to destroy the Vex intrusion, where they succeeded and repaired the Leviathan. However, as they destroyed the Axis Mind, the barrier protecting itself was removed, thereby threatening the Guardians to be consumed by the fiery inferno of the Leviathan. Calus then saved the Guardians from being sucked into the Leviathan afterward, where he rewarded and congratulated them for their efforts. The Cabal Emperor once again offers them more than just the power of the Light, as Calus demonstrated that he can keep them safe. He also warns them that the "end" is near and therefore must be ready, as he will find them again. When Val Ca'uor and the Red Legion invaded the Leviathan directly, Calus called upon the Guardians once more to expel them. Several of his Loyalists were slain and one of his duplicates destroyed personally by Ca'uor; however, with Calus assisting the Guardians with his own psychic powers, Ca'uor was killed, the Red Legion Fleet decimated and his forces routed. Calus watches with glee as Ca'uor dies and is impressed that the Guardians have grown "fat from strength and power." Calus tells the Guardians that he awaits the day they will stand by his side when the end comes. Altogether, Calus is a figure of contradictions. He is an emperor enthroned by and supporting populism; he is capable of genuine altruism immediately following ruthless conquest; he is self-centered but dotes on his subjects. His interest in the Guardians continues to grow, as he hopes they will become his Shadows and even saved them from being destroyed by the Leviathan, as they both defeated Ghaul and proved themselves to him that there was more to them than just the powers they possess. Calus laments the brutal, militaristic nature of the Cabal Empire as it is now, and desires Guardians to lead efforts to restore it to its former glory. Calus' decision to embrace his hedonism partly stems from the fact that he knows how the end of the galaxy is approaching quickly, and how he wished to revel in each small delight until the end comes. He states that the reason he won't kill the Guardian is because he's enamored with a warrior who won't yield in the face of such overwhelming despair. Emperor Calus will initially be immune to damage and will attack from afar with his Emperor's Gaze laser. He will summon an onslaught of Loyalists that must be killed, after which four unique Psions will appear on each of the four plates around the throne room. They each will each have a unique symbol above them: a War Beast, a chalice, a sun, or a pair of swords like the ones carried by Gladiators. These symbols need to be memorized for the next section. After a brief pause, Calus will clap his hands twice to teleport all Guardians into his mindscape, where they will be met with a giant projection of his head. Killing the Psions beforehand will just spawn extra enemies. There will be three Psionic charges that will teleport three players back to the throne room, while the remaining three are stuck inside. Those who remain inside will be inflicted with the Mind's Eye debuff, to show that they are being sucked in. If they are sucked in too far, then the Guardians will die. Those who remain in the throne room will have to kill more enemies, and the Psions from earlier will appear with the symbols appearing above them. In the mindscape, Calus' projection will show a symbol on his forehead. Each of the three players will each see a different symbol. Whichever symbol has not been seen is the symbol whose Psion in the throne room needs to be killed. This will repeat a total of four times for each symbol that does not appear. Those being sucked in, meanwhile, with have to kill two different kinds of Psions: regular Psions and their projections. The regular Psions must be killed so that their ruptures cannot send players into the air, and the Psion projections must be killed so that Calus doesn't use his Mental Collapse attack. As soon as they are all killed, Calus' projection will unleash a Psionic Overload, where he will spew purple skulls from his mouth. This is a sign that Calus is charging up an Imperial Nova attack that can wipe the entire team. He will be shielded while doing so. Destroy the shield to stop the attack, while the people inside will shoot down the skulls. Killing or damaging a skull grants a stack of the "Force of Will" buff, and these stacks are shared by the whole team. The more stacks the team carries, the more damage they can deal to Calus. After a while, Calus' projection will stop spewing Psionic Overload skulls, and three Psionic charges will appear that will teleport each player back into the throne room. And thus, the damage phase begins. All players must step on one of the four plates to deal damage. Since there are four plates, there are four chances to get in as much damage as possible. However, Calus will charge an Afterburn blast that can shut down the plate and kill everyone standing on it, thus causing players to jump to a new one after the timer for that plate has expired. After losing a set portion of health, parts of his body will break off, revealing a machine. He will also gain new attacks in addition to his laser: an arm-mounted Vengeance Cannon and a meteor storm that leaves behind circles of fire which deal damage over time. As his health reaches approximately 33%, he will charge up his Imperial Nova attack again. If Calus is not killed by the time the last plate stops giving the "Force of Will" buff, the team must start the encounter again, this time with some holes that appear in the mindscape, as well as different shields around the Incendiors and Centurions that appear in the throne room. During the mindscape phase, whoever kills the Psion whose symbol was not called out will be teleported to the mindscape, and one person will be teleported into the throne room to replace them. All four plates must be used at the same time during the damage phase. Calus is the third Cabal character to speak English fluently. The first being Ghaul and the second, The Consul. Calus inadvertently foresaw The Consul's death, as he wanted the Consul to die by his own weapons. Ghaul was The Consul's weapon in overthrowing Calus and when he killed the Consul during the Red War, Ghaul unknowingly fulfilled that vision. At one point, Calus uses the phrase "oh champion mine" in one of his letters, a phrase often used by certain enemies of the Light, suggesting less than honorable intentions for the Guardians. Calus refers to the different classes of Guardians as tribes. Revealed in the Raid gear, Calus hopes that once the Guardians stand beside them, each of the Guardian classes would have a special function in his restored empire. He hopes that the Hunters become the navigators of his vessels, the assassins in his armies and the treasure hunters for his lost repositories filled with the empire's secrets. He hopes that the Warlocks become his ambassadors, his technologists and his warrior-scientists to discover the secrets of the lost worlds his empire once ruled. He hopes that the Titans become the taskmasters to train his armies, both in personal combat and warfare, teach them to be both civilized during peace while vicious during wartime and to teach his soldiers to be selfless yet persistent in battle. Calus is the second person from an enemy race to side with the Guardians and the first of the Cabal. The first ally was Variks. The personality of Calus is similar to the real-life emperor, Cyrus the Great of Persia.